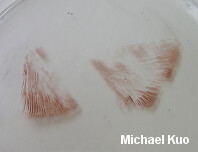 Entoloma strictius has a small to medium-sized, brownish, bell-shaped cap that changes color as it dries out, often resulting in a two-toned appearance, with paler shades on the central bump and in radial streaks elsewhere. The stem is proportionally long, and is often slightly twisted in appearance. 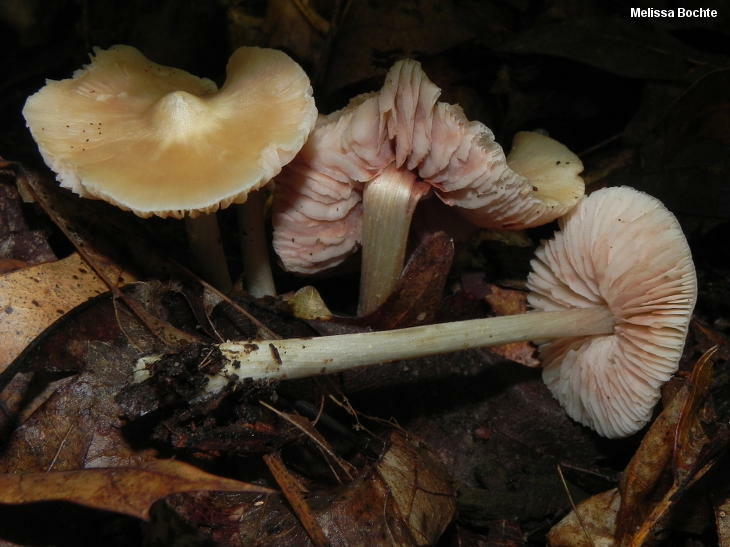 The species appears on the forest floor in eastern North America in summer and fall, and its gills are white before turning pink. Actually, there are several entolomatoid species that more or less meet the description above, and the addition of microscopic features (see below) may only provide the illusion of more confident identification. Ultimately, it is likely that there are many poorly defined species in this group, and that a precise way of identifying them--with or without a microscope--awaits a thorough, DNA-informed study of many collections. Synonyms: Nolanea stricta, Entoloma strictior, Rhodopyllus strictior--but not Entoloma strictipes (Peck) Hesler. Hesler (1967) records two varieties of Entoloma strictius: Entoloma strictius var. 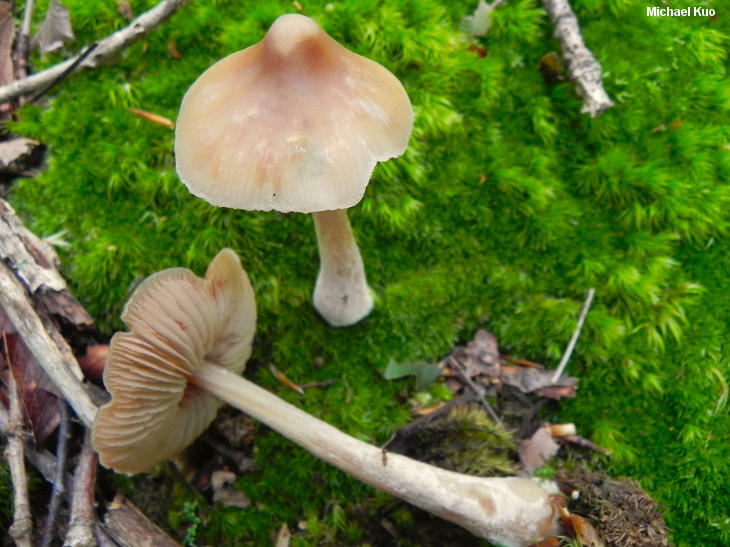 isabellinus, with buff to yellowish colors; and Entoloma strictius var. cystidiosum, with prominent cheilocystidia. However, Noordeloos (1988) doubts that the latter variety is closely related to Entoloma strictius. Ecology: Saprobic; growing alone, scattered, or gregariously under oaks, beech, and other hardwoods; summer and fall; probably widely distributed in eastern North America (my collections come from Illinois, Tennessee, and Kentucky; Peck's original type collection was made on the "[g]round in groves and their borders" in Albany, New York). A similar species is reported by Largent (1994) and Arora (1986), fruiting from fall through spring in northern California. The illustrated and described collections are from Illinois, Tennessee, and Kentucky. Cap: 3-9 cm; conic, becoming broadly conic or broadly bell-shaped, with a distinct but small pointed center; fragile; bald or finely silky; butterscotch brown to grayish brown or tan; damp, losing color markedly as it dries out so that the center is paler, along with streaks elsewhere; the margin becoming finely lined, especially when wet. Gills: Narrowly attached to the stem; close or nearly distant; whitish to buff at first, becoming pinkish and eventually brownish. 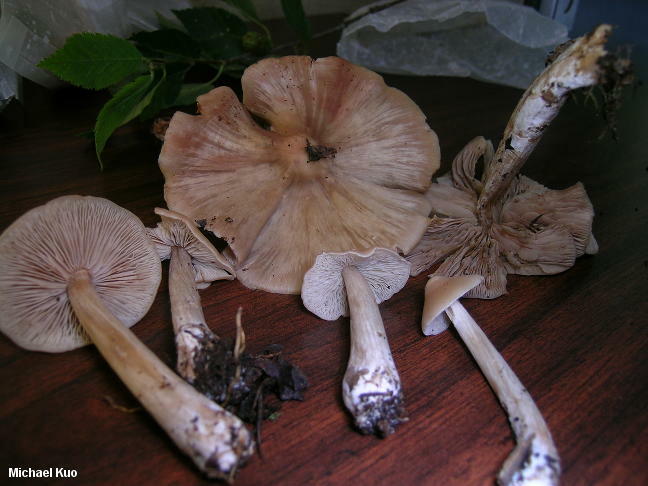 Stem: 5-10 cm long; 4-10 mm thick; slightly enlarged toward the base; finely silky; often twisted; colored like the cap, or paler; with white basal mycelium. Flesh: Thin; fragile; whitish to brownish when wet. Odor and Taste: Odor mild, sweetish, or disagreeable; taste not distinctive. 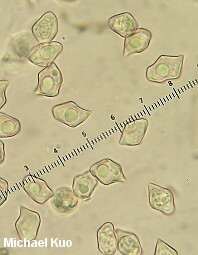 Microscopic Features: Spores 8-12 x 6-8 µ; mostly 5-sided but occasionally with 4 or 6 sides; smooth; hyaline in KOH, with one large guttule. Hymenial cystidia absent. Pileipellis elements hyaline to brownish in KOH; not encrusted; mostly repent; sometimes somewhat gelatinized. Clamp connections not found. REFERENCES: (Peck, 1870) Saccardo, 1887. (Hesler, 1967; Smith, Smith & Weber, 1979; Arora, 1986; Noordeloos, 1988; Lincoff, 1992; Metzler & Metzler, 1992; Largent, 1994; McNeil, 2006; Miller & Miller, 2006.) Herb. Kuo 10150402, 07221002, 07111201, 06231303.